This map below it comes from the 1983 council history book Boys Will Be Men. Many changes since the last list from 1962. Gone are Bedford, Black Patch, Central, Cordell Hull, Maury, and Williamson Districts. 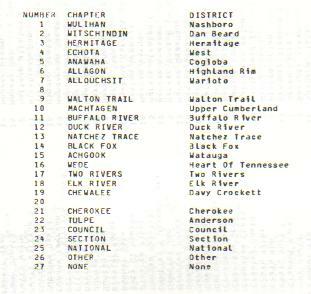 New districts include Cherokee, Duck River, Nashboro, Natchez Trace, Two Rivers, Warioto, and Watauga Districts. The list at the bottom of the page is from the 1983 Wa-Hi-Nasa Lodge Planbook. While you would expect it to have the same districts, it also has Anderson District which is not shown on the map. 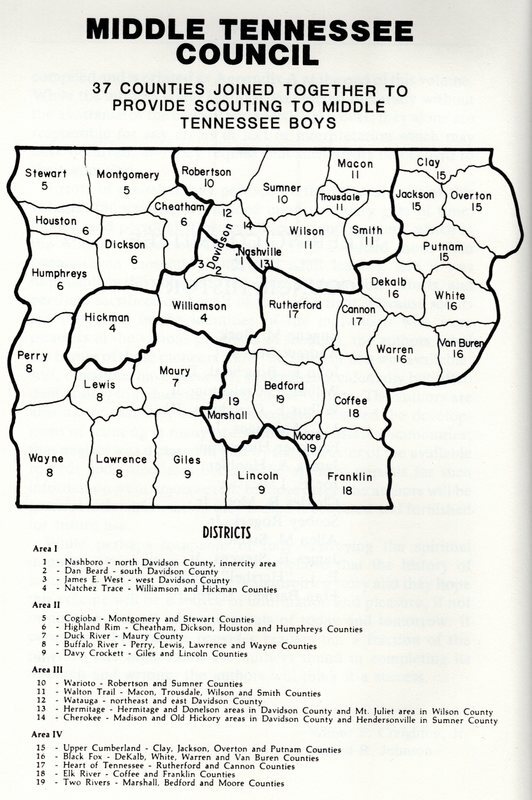 Anderson District was a short lived inner city district 1976-82. It was most likely absorbed by Nashboro in 1982.